FLP: What was your overall experience being a Free Fall artist this past year? MG: The past year was a wonderful experience on a number of levels. Photography is exploding in Atlanta, and Bill and Michael sensed the need for a platform for local photographers. They created a place where artists can share work and interact; Atlanta photographers are located throughout the metro area and at times have little opportunity for genuine discussion. Most people have access to the internet, but who wants to sit on a computer? I have a great deal of gratitude for the time spent with everyone at Fall Line, and I’m thankful to have been included. FLP: Did you go into this project thinking of the four publications as one narrative or as four separate entities? MG: Each issue is separate, with a beginning and an end, but I like to think that there’s a great deal of continuity from issues one through four. The way of looking, may particular type of visual contextualization, is a constant throughout, even though the circumstances of the making of the images changes. Incidentally, the photographs for the final issue were created in the months of April-June 2012 in Lexington, VA where I lived until recently. 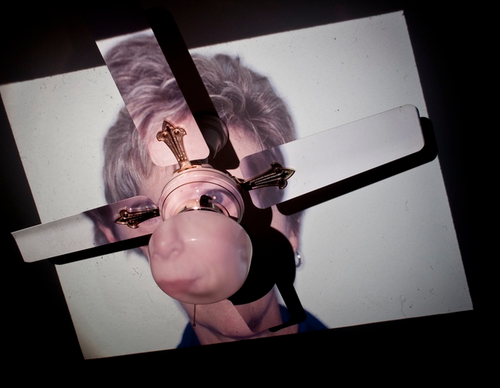 FLP: The first image of yours I came across was a picture of a face projected on a ceiling fan. I myself have a fascination with ceiling fans and was wondering what you’re trying to say with this image. MG: That image is a photograph of an old slide projected onto the ceiling of my boyhood home - it’s an image my father took of my mother. In helping my mother move from the house after 37 years of occupancy, I was interested in the memory of the place. For example, the chintzy, gold accents of a mundane item such as ceiling fan have a particular presence for me, due to familiarity and the memories, experiences associated with that very room. To the present home owner, of course, that fan means nothing. I wanted to portray a psychic attachment of sorts to the utilitarian. FLP: The printing of your first issue was very interesting in the way you have to flip between two pages to see some images in whole. Is this simply form meeting function and a reference to Free Fall being printed material in book form? MG: The sequencing is a reference to Beautiful Ecstasy by Michael E. Northrup (J&L Books, 2007). FLP: Your second issue seems to have some art historical references, specifically John Baldessari and Richard Prince. Was this a theme for the issue or something relating to your larger body of work? MG: The second issue was a bit different, in that images of casette singles and “repurposed” magazine advertisements appear alongside my more traditional images. The more photographs I look at, the more catholic I become in selecting what a photograph can be and how it can function. FLP: Can you talk a little about your images of cassette tapes? MG: It’s a consideration of a number of things. Foremost perhaps, it’s a consideration of the “phenomenon” of the cassette single as a cultural artifact, a marker of a particular time. I think of cassette singles as the last gasp of the various mass-produced analog music formats, right before the popularity of the compact disc. The imagery often entails a particular notion of masculinity: simultaneously macho and androgynous. I’m interested in pop culture items, and the meanings and associations we ascribe, collectively and individually, to merchandise. They’re essentially pieces of junk, and I print the images large (40X50) so the deterioration of the cardboard is emphasized. The cardboard fibers take on an interesting texture at that scale, as do the Ben-Day dots of the graphic elements. Everything is writ lage, obviously, in a way that alters the viewing of the objects and gives them monumentality. FLP: What are your thoughts on using flash? I’m talking specifically about the first and second to last image in your third issue. I know some photographers are completely against it and I was wondering whether you think it adds something to the photograph to whether it was just necessary to capture the image. MG: I love the formal properties of flash for certain photographs. The pop of the strobe can instill ambiguity or an otherness to an image, and at the same time suggest an immediacy to the making of the picture. Of course I’m referring to a sense of immediacy or truth-to-appearance before the lens that can be as contrived as any other element of picture-making. The aesthetic of the on-camera flash suggests to viewers something about the making of the picture, the context of the image capture. The fact that some photographers find blatant flash use distasteful only increases my resolve. FLP: Can you talk a little about photographers and artists who have influenced your work and why? MG: Finding William Eggleston’s work in the mid-1990’s changed everything. Only then did I think about photography as a serious pursuit. Here was someone who recorded the common and decontextualized the familiar at the same time. In some ways, every image I make is an attempt to recreate, not Eggleston’s pictures, but the feeling of seeing his pictures for the first time: apparent randomness obedient to an almost imperceptible rhythm. Recently I’ve become acquainted with the work of Stacy Krantiz and Hannah Modigh and their representations of place. FLP: Does teaching photography affect your work in any way? MG: Absolutely - I’m always amazed at what students bring to the classroom, particularly those who have relatively little photography experience. It’s incredible what a little earnestness and sincerity can produce. FLP: After going through your website and tumblr I’m interested in knowing whether you’re more interested in straight photography or taking a more conceptual approach. MG: My work with Fall Line has concerned fairly straight images captures but I’m also interested in conceptual work. "The Competitive Apnea Project," something I’ve been working on for five years, combines my early childhood photographs with newly-created staged images which depict a fictional account of my futile attempts to break the breath-holding world record. The series is a dialogue with a number of issues: responding to a familial legacy, pursuing an alternative form of art-making or expression with single-minded purpose, and re-contextualizing the visual phenomena of the vernacular snapshot. The genesis of the project concerns a 1964 Garry Winogrand photograph of my father, who at the time was performing as an underwater clown. True story!